Nikica Pirović was born on 21 May 1977 in Split. She finished Primary school in Omiš. She attended Secondary medicine school, branch pharmaceutical technician in Split. She completed secondary schooling in 1995. In the same year she enrolled the faculty of Dentistry in Zagreb, and graduated in 2001, when she started her apprentice period of service in Dentistry polyclinics Split. After the apprentice period completed, she started working in Private dental practice of Milica Ćorić, dr. dent. med. u Split. In 2005 she started her own private surgery, where she has been working ever since. 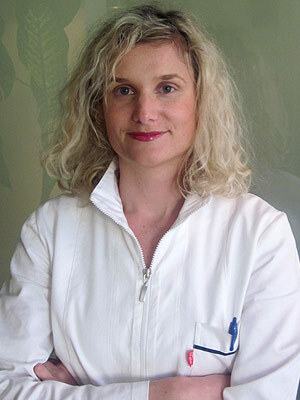 In 2009 she started a specialist training in family dentistry at Clinic for dentistry at KBC- Zagreb (Clinical Hospital Centre Zagreb) at the Faculty of Dentistry and Dentistry polyclinics in Split. She passed her specialist exam on 17.01.2013 and got the title “Specialist of family dentistry”. on 4.12.2012. With it she got the title “University master of dental medicine” (univ.mag.med.dent.) Since summer semester 2012 she has been taking part as a subcontractor in lectures in Dental morphology at the study of Dental medicine of Faculty of Medicine in Split. She is married and mother of three children. Nurse Jelena Madir (born Lončar), born on 24.08.1984 in Splitu. She finished secondary medical school in Split in 2003. She has done her apprentice period and passed the state exam and she has a permission for independent work, licence. She graduated from Undergraduate Study of Nursery in Split on 27.09. 2012, and got the title of Bachelor of Nursery (bacc.med.techn.). She is familiar with computing (word, excel), and has knowledge of English in speaking and writing. She has been working in pleasant environment of dental surgery of dr. Nikica Pirović for five years. She is married and a proud mother of two boys, Luka and Nikola.